I have now abandoned my Scout and support for it and have built a DJI Flame Wheel F550 ARF kit. This pages will still be hosted for your reference only, comments have been closed. FIRSTLY!!! If you have not yet bought a Scout, I highly recommend you don’t at the present time! There are many problems surfacing both software and hardware, as you will find out in the GETTING STARTED GUIDE and on the MODS page. You will spend MANY hours up to your elbows in Scout parts tuning, tweaking, and slaving over a hot soldering iron. You will get NO support from Walkera directly – if you can’t be convinced, make sure you buy from a reputable authorised local dealer! Though its fairly easy to fly, the Scout is not recommended for beginners. You have been warned. 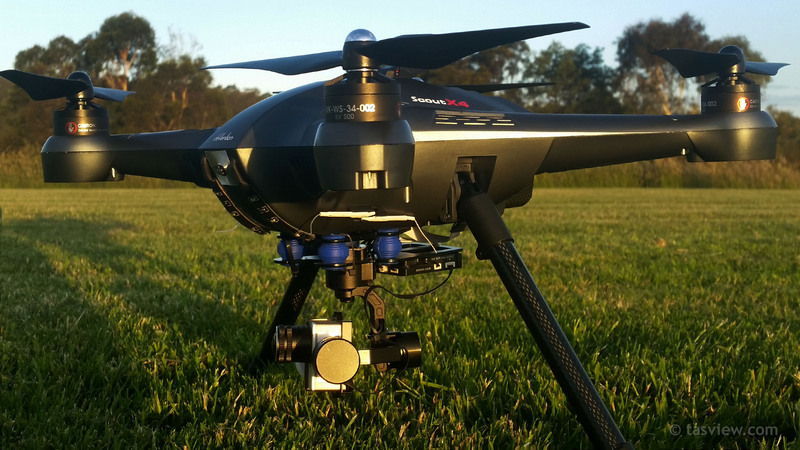 Delivered on 13/10/14, this is the first purchased Scout X4 in Australia, This page will be updated as it is tested and used. 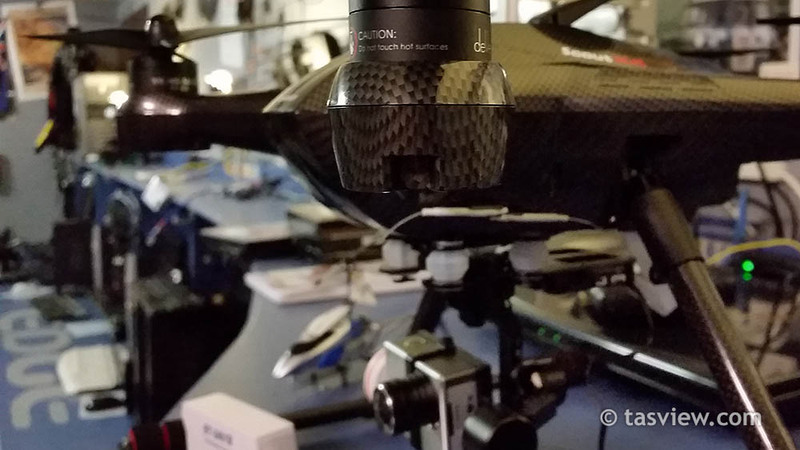 Features include: Auto take off and landing, ,Follow me mode, Fence Flight, Single and multi waypoint flight, Backtracking, waypoint record, Object Round fly mode, Hyper IOC mode, Altitude hold mode, One key Return to Home, Retractable Landing Gear, 5.8G video downlink. Can be controlled by Devo F12E transmitter or GSC Android app via Bluetooth dongle. iLook+ 1080p camera with 5.8ghz live video link, G-3D 3-axis brushless Gimbal. The Scout I recieved did not come in a big Aluminium carry case which is an option and looks very nice. Unless the foam can be reconfigured, you need to remove the legs, propellers and most likely the gimbal to use the case, it’s not something I think is practical on a regular use basis but may come in handy for travelling or storage. Scout X4 Battery compartment showing connections. While the two main battery terminals are big and strong, be careful not to damage the small 3 prong connector which seem quite fragile. These pins are spring loaded and supply information to the battery lights. Lithium batteries are recommended to be discharged partially rather than fully. Frequent fully discharging should be avoided. Instead, charge the battery more often or use a battery of larger capacity. Full capacity cannot be reached until it has been subjected to 10 or more charge cycles. The cyclic process of charge and discharge will optimize the battery capacity. TAKE CARE CHARGING, USING, STORING AND DISPOSING LIPO BATTERIES – FIRE RISK!! – READ THE INSTRUCTIONS. See THE SCOUT X4 GETTING STARTED GUIDE for further information. When you first power the Scout and radio, the legs are currently in the UP position, that is GEAR switch down position 1 on the radio for the legs. Make sure the thing is upside down or somebody holding it when the legs deploy! While the pre-production version of the Scout had an adjustable GPS antena secured by a nut and bolt, Walkera have changed it to a fixed antena on the production model. This makes it more rigid and can be vunerable when the craft is handled. There is now a larger new shapped antenna on the latest batches. I’m waiting for someone to pull one apart for comparison to see if there is an upgrade internally. This round one uses old technology and the GPS isn’t very reliable. 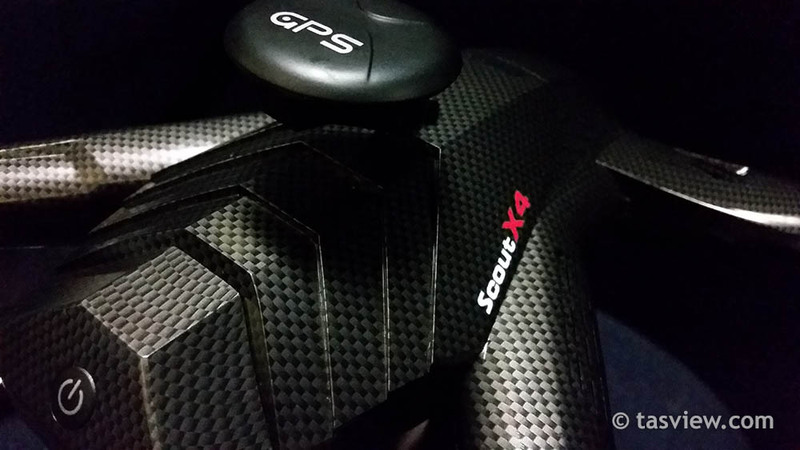 Walkera Scout X4 GPS antenna is fixed on the production models. Later version Scout X4’s have the antennas below coming out of the opposite holes and the front one is orentated 90% upwards. 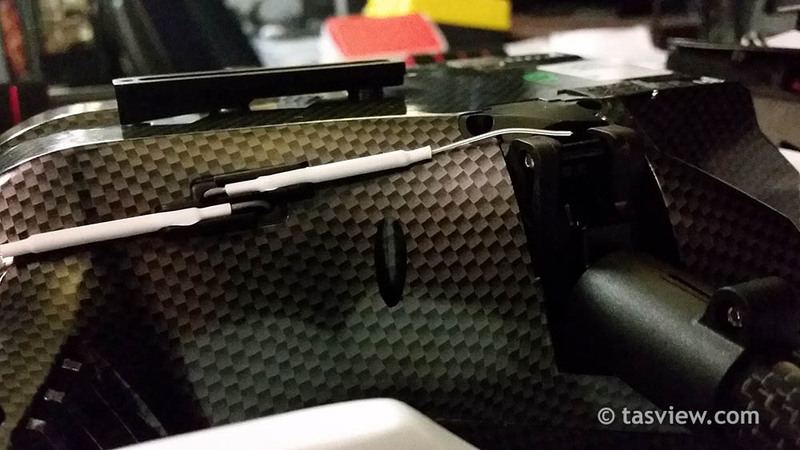 Perhaps Walkera ran out of black heat-shrink for the antena? 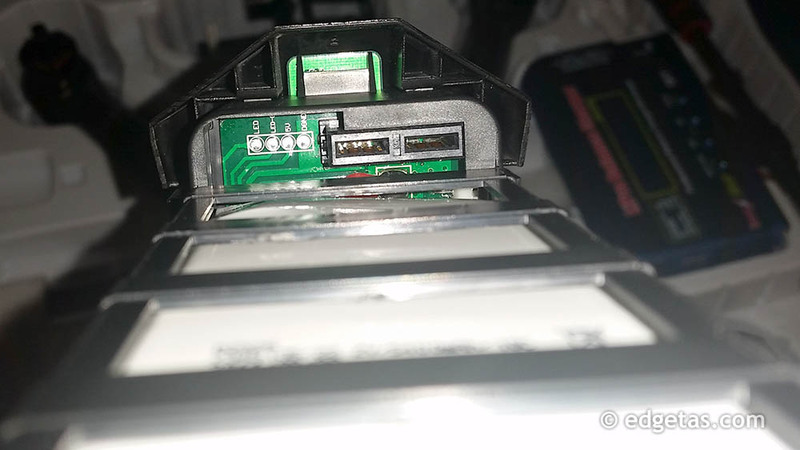 People have reported the Scout’s USB port breaking of the PCB. Mine were not soldered on properly and needed hotglue. 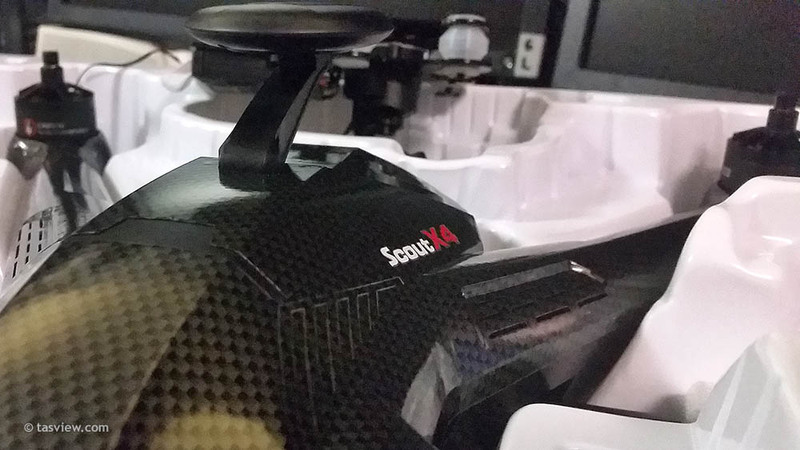 The Scout X4’s underbelly, showing the Gimbal mount for the camera, the antena for 2.4gHz control reciever and retractable leg pivot point. The gimbal slides from the front of the craft onto this plastic rail and secures with a spring loaded thumb screw. The legs are secure in their mounts and have some give. A mod is required to help prevent the leg servos failing and fuses should be added to prevent the mainboard failing if the legs fail as they are on the same circuit. Supposedly Walkera are aware of this issue and are looking into it. The plastic T that holds the feet on also has some flex. This may be a good thing to soften landings or could add some bounce. They aren’t overly strong but I believe you’re better off breaking a $6 carbon leg tube than having it spear up through the body and damaging more expensive electronics. The Scout X4, legs down and assembled with props, 3D gimbal and iLook camera. It has some decent motors fitted with the option to add 4 more underneath via a removable panel, potentially making this quad a heavy lifting octocopter at the expense of flight time. The supplied G-#D gimbal doesn’t seem very strong but has miraculously survived a few solid hits and continues to function. The top controller is weak and needs modding. Top view of the Walkera Scout X4 showing GPS and rear body detail. Looking perhaps a little too serious, the Scout has nice lines and looks almost cyborg insect like on some angles. Designed to scare small children and horses! While the exterior of the Carbon black version looks sleek, there is a film applied over the plastic body. Lift and wear may be an issue in the longer term. Looking through the lifted part with light behind it, I can faintly see the carbon pattern. UPDATE: I put a strip of contact over the nose to stop it lifting further but the contact wasn’t suitable. 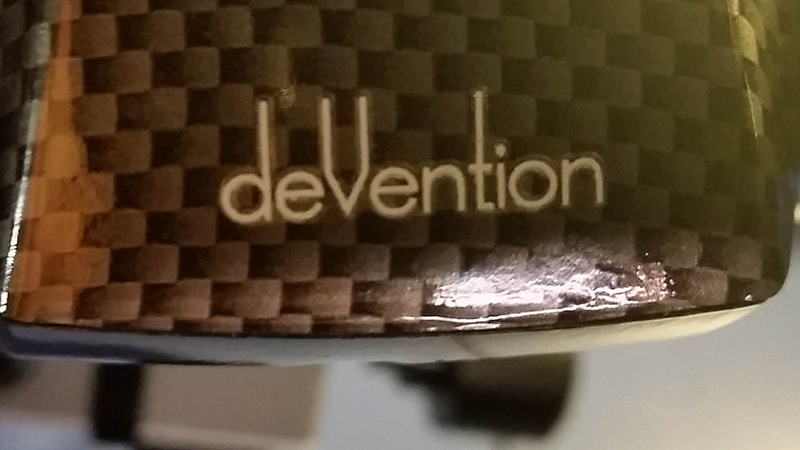 On removal, the Carbon pattern stuck to the contact. The body underneath is grey. At least now there’s no lifting edge. I’ve now put a small piece of black electrical tape over the nose which has worked well. New bodies are already available from walkera.com for $36 US. After a few incidents, I have now transplanted my Scout into a new grey case and I think it looks much nicer and is better finished than the Carbon version. 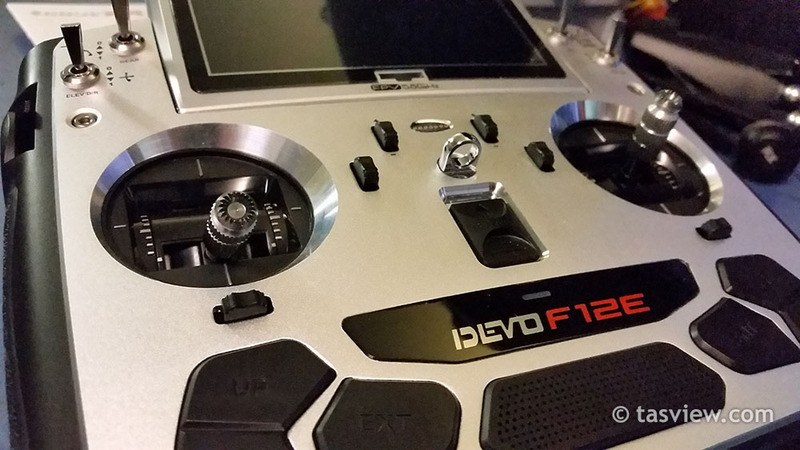 The controller included in the RTF version is the DEVO F12e 2.4gHz transmitter. This TX (Transmitter) seems well built and dispite it’s large size feels quite ergonomic. Straight out of the box, one of the side peices of the sun-shield had popped off as the lugs/hinge that hold it in are very thin. On first use, it popped off again. You can purchase seperately a Dondle and software to use for pc sim practice. I have so far not located a user manual for this device – Some things not documented: Charges via the USB – but this needs modding before use or it may break like mine did! I believe this device uses a Bluetooth connection to your phone or tablet and 2.4ghz connection to the Scout X4. The Bluetooth range is only about 8-10 meters but should be sufficient as you would normally carry it with you and your phone/tablet. The 2.4G link should give the Scout normal operational range, though because waypoints are uploaded to the quad, it may permit it to fly out of range using the app – this is not confirmed though, only speculation. 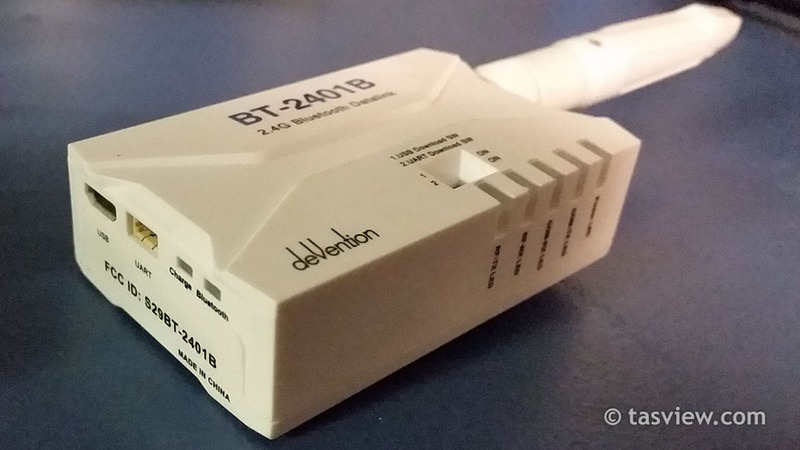 The BT204B worked fine with my Samsung Galaxy S5 during brief initial testing. A few users have now tried the bluetooth groundstation with mixed results, it is not recommended using it until the software is more refined and proven. Unfortunately, the first time gently I put a USB cable in the BT2401 USB port to charge, it broke away from the PCB and pushed into the body. I was able to have it solder it back on. I checked the USB ports in my Devention Padholder, both of them were not soldered on properly at the sides so I had to hot glue them. See THE SCOUT CHECKLIST AND TIPS page for beginners guide and further information. Based on my experience to date, I would NOT recommend the Scout to someone new mulitrotors and would hesitate to suggest more experienced flyers take up the Scout challenge – and challenge it is! 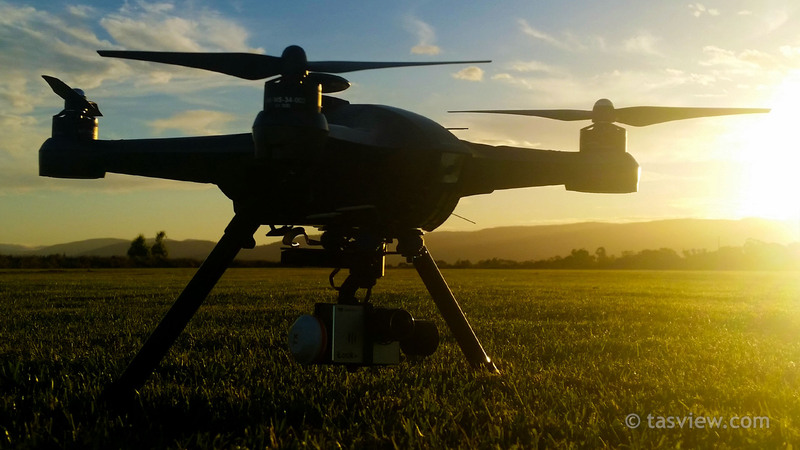 While it is relatively easy to fly and lots of fun when it does, it is still very new technology and has had MANY undocumented problems and quality control issues causing even experienced pilots to crash or have problems with their Scout. Though some have so-far managed to have an incident free experience, mine has been far from it. The documentation that comes with the Scout is inadequate, incomplete, poorly translated and in places wrong! The support I have received from walkera.com has been NIL (after 8 weeks contacting them). You are essentially on your own and it seems what little warranty is offered is worthless. Having said that, I’ve also been dealing with Walkera Australia who have looked after me very well considering my Scout was not purchased through them. If you do decide to get one, make sure you buy from a reputable authorised local dealer! As a newcomer to multicopters, I’ve had to learn a lot in a very short time, often the hard way and through no fault of my own! – I was the first to discover the Scout will fall out of the sky if the RTL height is set at 0m apparently due to an apparent barometer error. – Another first to find: the Scout’s ‘manual’ mode as documented in the users guide still requires GPS lock before lift off, if you don’t wait and the Scout gets a GPS signal in the air, it will tilt and accelerate – probably very luckily into my house! – I had the first Scout retract switch break – a design fault carried over from the Tali H500 as it turned out. 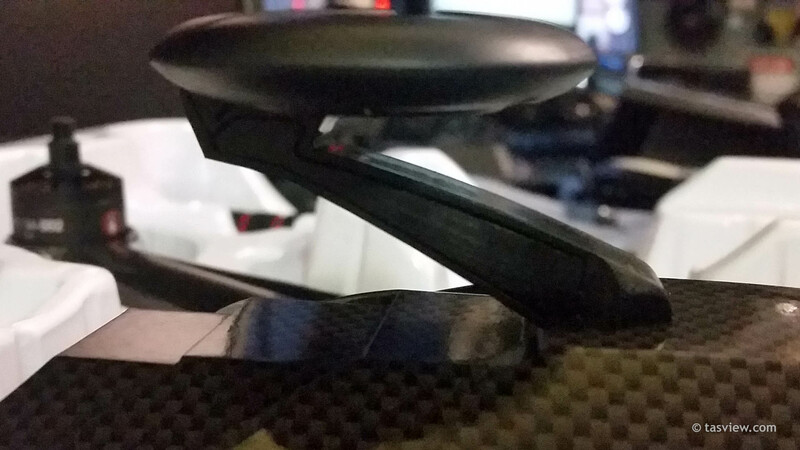 These problems occured in some previous Walkera multirotors but were previously undocumented for the Scout. – I was also the first to discover the USB ports in the BT-2401B and padholder may detatch due to poor soldering. – The sliding switch on one of my Scout Batteries has failed. You may need to be fairly technical and mechanically minded and able to use a soldering iron but parts are reasonably priced if you do have an incident. The best place I’ve found to get help is the new Facebook Walkera Scout X4 and Tali H500 Support Group and ask your questions there. Unfortunately there is no official Walkera representative in the group but two beta testers are, as well as some very experienced users. There are still some unexplained events that have happened to other users, yet others are reporting few issues. I have a background in still photography and bought the Scout to use like an aerial tripod and get into some video. It’s a good fun sports flyer but can be tamed down in Mission Planner for slower and smoother control for video. Though it is fairly stable now using slow movements, my Scout will drift or keep flying on about 10m in GPS mode after full speed horizontal flight when you let go of the sticks, something to be aware of with obstacles around, I’m hoping to sort that out. I’m still researching and tuning PID setting and flying when the weather enables. I’m hopeful things will improve over time in reliability for me and support from Walkera and I can write a more positive review, but for me – quality control, lack of documentation and lack of official feedback has been a major issue. When the Scout is good, it’s good fun and flies well, but mine at least has had more than it’s fair share of problems. In my opinion, if you’re looking for a trouble free multirotor for video or photography – it would be wise to consider others first. ScoutX4 Sunset after a fun day’s flying. *** This is in no way an official guide, the author is an independant owner not associated with Walkera, DJI or any other quad manufacturer. If you try anything on this site you do so at your own risk. This site is assembled from research, interaction and personal experience for my own use and is evolving – a sincere thank you to all sources – much of the work is not my own nor do I claim it to be. I hope you’ve found this page helpful. Do your own research, ask questions, help others – happy and safe flying. This page was last updated 19th March, 2015. One big problem with Matt’s 2 meter RTL setting, is if for some reason your TX dies or TX battery. If your scout is 2 meters up and your short, there is no way you can grab the scout and turn it Off manually, so you have to take your height into consideration. Since this article have those software and quality control issues been resolved? I’m not sure anyone other than Walkera knows for sure. Despite many attempts by me to contact them they will not reply to my emails. I have read that they are aware of some of the issues I have listed but don’t know if they are actually working on remedies or whether they will support current owners who have had these problems – it would be nice to know and get support from them but information directly from them unfortunately seems all but impossible with seemingly no official forum or representative/spokesperson. 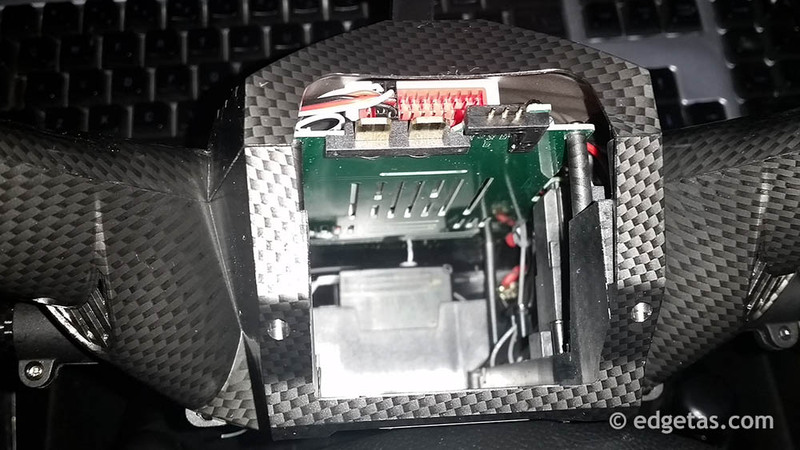 There is a new casing on the latest GPS antenna which is squarer, thicker and has a shield shape in it as well as the wire antenna’s on the bottom sides of the Scout now being offset with one pointing up the body instead of both laying flat, however users of these one’s have been reporting problems too. If you’re on Facebook, you may find out more in the SCOUT X4 group:. Use the search function or ask questions there. Hi I am the Phantom 2 Vision Plus administrator of this site (I approved your comment), I will inform Tone of your question as he is the researcher involved with the X-4, and I have no information regarding this. As your question is an important one, I will immediately inform Tone to respond to what he knows regarding this as quickly as possible. Great article, I would really appriciate it if you could add some wireing diagrams, also How to update and what updates are best and Where to find the updates! Also Buying replacement parts for this is hard to find, Say my airblade antena 5.8GHz for better signals. I have printed out your whole article and have read it several times and still come to a problem when im looking for the listed above subjects. I would also like a full listing of all the setting and also if you can add a listing of what each field of settings listed mean, Say like, when im setting up my AUX 6 what is Aux 6? and if I put it at one setting what does that do exactly? can i Customize it? You have so much stuff on here already and I want to help you if possible but im more or less here to learn about my new toy. 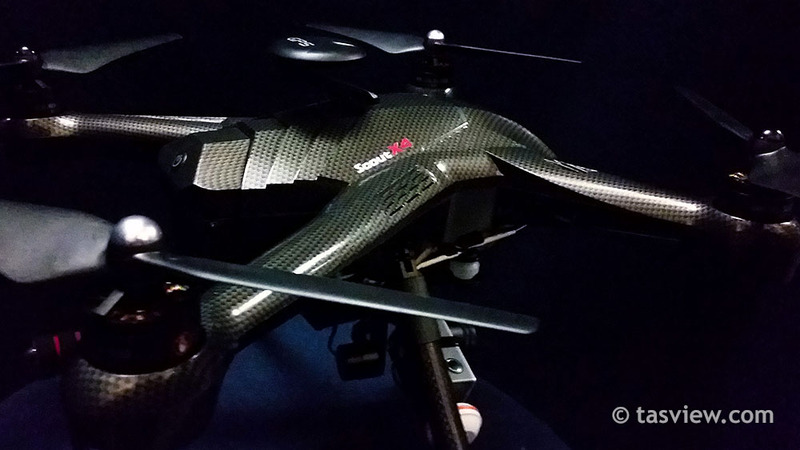 Drones are very much so the future and we are pioneres in this field. Think about it. I got hired by several companies in my town to shoot comercials for them. Golf coarses, auto dealers. Usually locally owned places but I still make anywhere from 100 to 150 bucks a hour including down time for rechargeing my batteries. ive already paid mine off from these too. SO now that ive given away my secret lol do you think we can make this better? to be honest you are my primary and only source for my drones help and information and youve done really good job on your article thank you very much. Please let me know if I can help or if you can help me personally. Maybe if I take too much of your time, Ill compensate you for your time. Thank you again! I’ve not had much experiemce with the BT and CGS app as there were always other issues to sort out. If you haven’t found an answer yet join the Facebook “Walkera Scout X4 and Tali 500 support group” and ask in there. I would highly recommend not buying this beautiful high-tech piece of trash. After spending $1600, I received my first one about 2 weeks ago. It flew fine for the first 3 flights. Then, on the fourth time out, during a slow turn, the back motors stopped and the front went full speed. The X4 flipped upside down, all motors stopped, and it fell straight to the ground from about 30 feet high. The frame cracked into several pieces and both sides of the landing gear broke off. The X4 was completely destroyed. Luckily I received the wrong iLook cable and the gimble mount was missing so I did not have the camera mounted at the time. (2 weeks later and I am still waiting for those missing parts) I did not even try to return it – there is no way I would get a refund or replacement. So, like an idiot, I bought just the X4 itself (no RC, Camera, batter, etc.) as a replacement for $800. On the second flight, I was coming down from a high altitude in a very controlled manner and, again, at about 30 feet, all four motors stopped. The X4 started free falling. I quickly hit the throttle all the way up with no response. Finally a few feet from the ground, the motors powered back on. The X4 still hit the ground hard but only the landing gear broke. The X4 still flies. This loss of power has now happened to two completely different X4s. There is no doubt in my mind this is a problem with the X4. I have been flying quadcopters for over 10 years. The batteries were brand new in the RC – not that that should matter. I will never buy another product from Walkera again. Nothing! They have taken me for $2400 and I am sure they are laughing all the way to the bank. Be warned – The Walkera Scout X4 is trash. You will be sorry and out a lot of money if you do purchase one. Save a little more money and buy the new DJI Inspire. Hell, throwing the money in the trash would be better than owning an X4! I completely agree with your post Johnny. I recently has a pilot error (a crash that was my fault for a change) which caused about $450 damage. I decided to abandon my Scout and spend $650 on a ARF kit instead – I just finished building a DJI F550 Flamewheel, had my first trouble free flight yesterday and I already have more faith in it than I ever had with my Scout! Flew beautifully, nice and stable and I know the soldering was done properly! Yup, 1st time I tried to charge my bluetooth datalink, the USB broke loose. $375.00 to replace. I hot glued the new one and it worked great. Thanks for the tip. Now if I can figure out the best tablet to use with it, I can try the Ground Station. Thanks – Bob. Probably one of the Samsung Galaxy or note tablets would be the best (stabilist) options. I got a mobile phone repair shop to resolder my usb for around $30. You could get your other one fixed and sell it.